Twisted Sister, Korn, Kreator, Coal Chamber, Mayhem, Dark Funeral, Katatonia, Heathen, Entombed, Unleashed, Asking Alexandria, Varg, Veil of Maya, In This Moment. Slipknot, Within Temptation, Bullet for My Valentine, Saxon, Down, Heaven Shall Burn, The Devil Wears Prada, Udo, Overkill, Absu, Caliban, Lock Up, Aura Noir, Brainstorm, Amaranthe, Dunderbeist, Between the Buried and Me, Sylosis, After the Burial, Hacktivist. 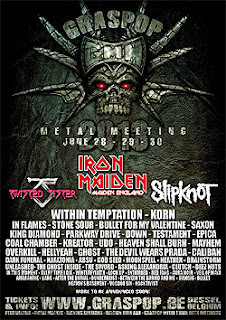 Iron Maiden, In Flames, King Diamond, Stone Sour, Testament, Parkway Drive, Epica, Hellyeah, Ghost, God Seed, Moonspell, The Ghost Inside, Deez Nuts, The Sword, Clutch, Winterfylleth, Every Time I Die, Red Fang, Bullet, Heaven’s Basement, Voodoo Six, Helloween, W.A.S.P., Prong, All That Remains, Tankard, Newsted and Love And Death.